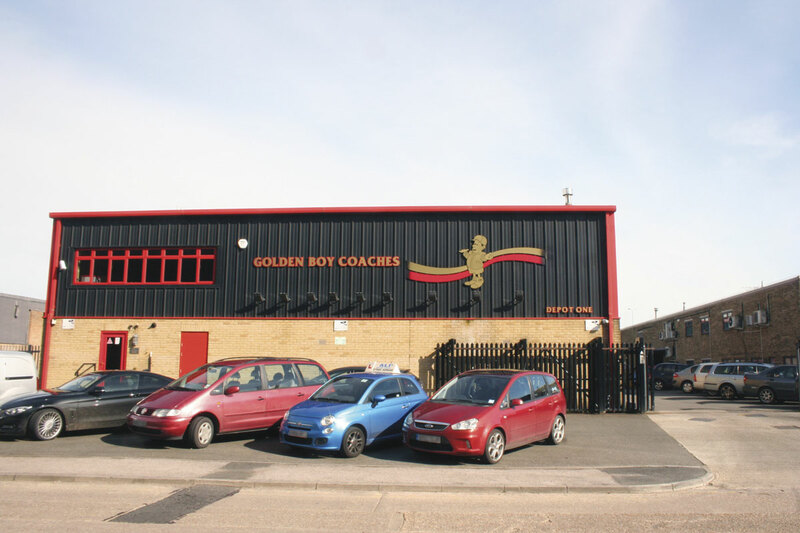 Training in the safe driving of buses and coaches is already something almost all operations are doing, however Golden Boy Coaches has taken it a step further. 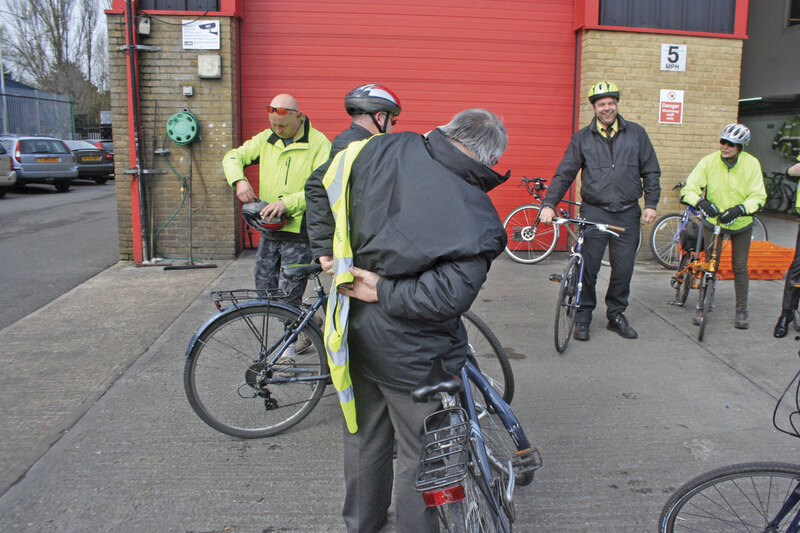 The Hertfordshire based operator has been giving its team training in cycle awareness. No, it is not expanding into operating bicycles; rather it is allowing its drivers to see the road from the cyclist’s perspective. The idea behind this is to give the employees some insight into what this often vulnerable road user goes through, to enable them to better understand and deal with pushbike riders. Cyclist deaths, particularly those caused by collisions with PCVs, have gained some considerable media attention in recent times. Despite how overblown reports in newspapers and other news sources have made the extent of these incidents seem (car collisions cause far more deaths, for instance), it is still worthwhile ensuring drivers are well versed in ways to avoid such tragedies. 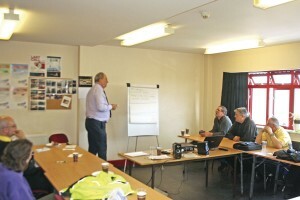 Chris Peat attended one of the training events at Golden Boy, which were organised by industry training company, Minimise your Risk, in conjunction with Cycle Confident. 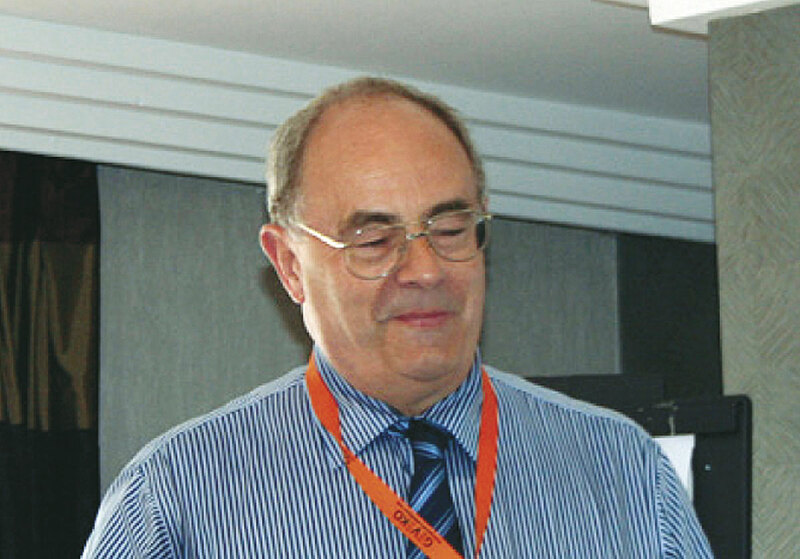 Readers may well already be familiar with the former organisation, perhaps having undertaken some training with its founder, Alec Horner. The latter are London based cycle training experts. 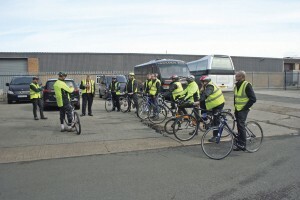 Attending the course, it was clear that it was already gaining some interest from further afield than the bus and coach industry, with a cycle awareness and skills trainer based in the Hertford area attending to assess how useful it would be for putting trainers from her organisation through. Once all drivers were in the classroom, proceedings got underway with all participants asked to show their driver’s licenses, as the course counts towards the Driver CPC 35 hours of periodic training. The students were split in two, with one group spending the morning in the classroom and the other starting with the practical side of the training outdoors. I chose to participate in the practical side first, which started with a briefing session before actually hitting the roads. 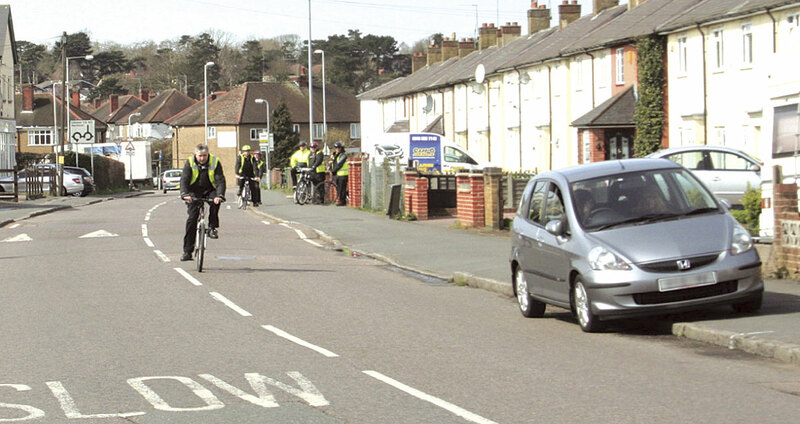 Here, the Cycle Confident trainers made it clear that safety would be paramount. 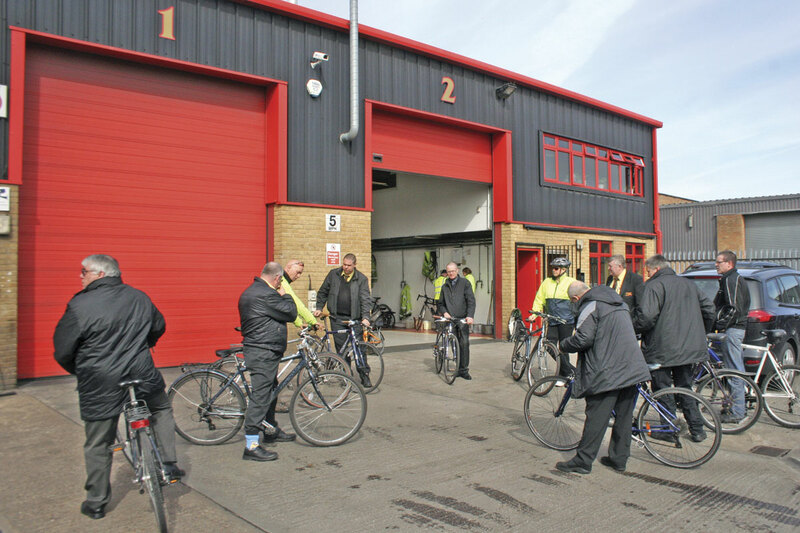 It was explained that the course would cover how to deal with traffic on bicycles and how a trained and untrained cyclist will behave. 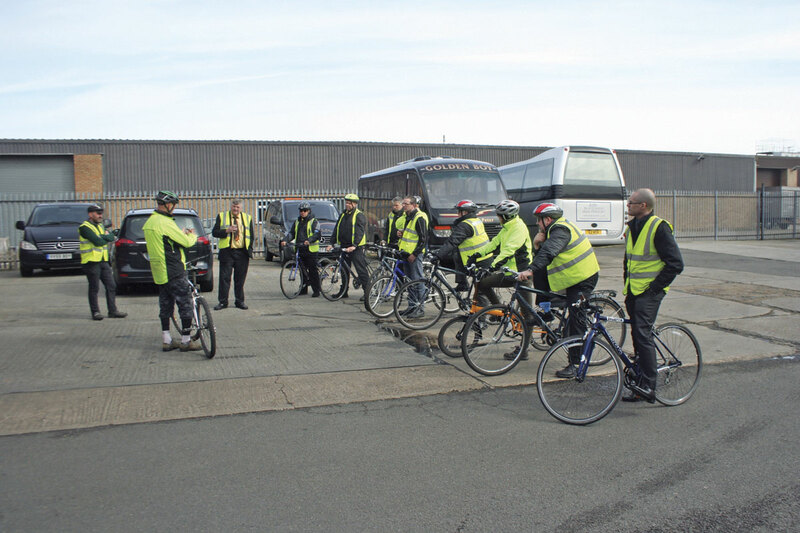 The briefing gave the instructors a chance to get a grasp on what the drivers already knew and what their attitudes towards cyclists were. 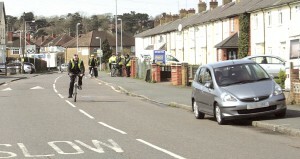 It was found that many had not been on a bike in a long time, apart from a rare stint last summer on holiday for some. The instructors asked the trainees what bad things they had seen cyclists do. Examples included pulling wheelies, no lights, not using cycle lanes, squeezing in through potentially dangerous gaps, no high vis gear and riding on the pavement. The trainers went through these points and discussed them with the trainees. They also debunked a lot of ideas promulgated by the media, ridiculing the idea that cyclists and motorists are ‘two tribes’. This is not the case, they state, saying people who ride bikes often drive too. Pros and cons of using helmets on bikes was discussed, taking into account the drivers’ experiences with them and what the instructors know of them. Another issue they raised was why cycle helmets were not compulsory, explaining the political agenda behind it. It was said that putting in place too many obligations for cyclists would detract from TfL’s and the government’s goals in encouraging more to cycle. Cycle lanes were explained. These may be used if the cyclist thinks it will make their journey safer. There is no obligation to use them. There was criticism of the fact that cyclists often are not involved in the design of infrastructure, so it is to be expected that what is put in place might not be favoured by all pushbike users. The example of the Cycle Superhighways in London was given, which has surfaces covered in gloss paint, making them slippery, particularly when wet. The drivers were reminded that not everyone has the high level of training they and fellow coach drivers have. What may seem common sense to a coach driver may not be for most road users. It was also explained that lots of drivers and cyclists do not understand the requirements of large vehicles on the road. Once the briefing was over, the drivers were kitted out with a pushbike. Although they were given the option of bringing their own, many used Cycle Confident’s cycles, which the trainers brought with them. Once they had selected a bike, the instructors ensured the seat was adjusted to the correct level. Ideally, it should be at such a height that the rider has to tip-toe in order to stay on the seat when stationary. As mentioned earlier, safety was a key concern during the day. As such, the training company brought with them a good amount of cycle helmets. These were readily handed out to anyone that wanted one, but were not mandatory as it is not illegal to forego wearing one. All trainees and trainers wore high vis jackets. 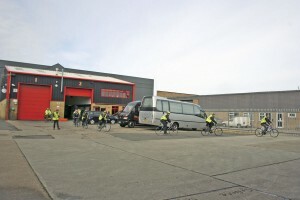 Before going out onto the streets, the drivers were given a chance to practice in the depot yard. First, they were allowed to ride around to get the feel of the bikes, how they handled and how they braked. Following this, they had to do an exercise to practice their turning. This involved biking from one end of the yard to the other, turning their head behind them to check for traffic and signalling a right turn with their arm. 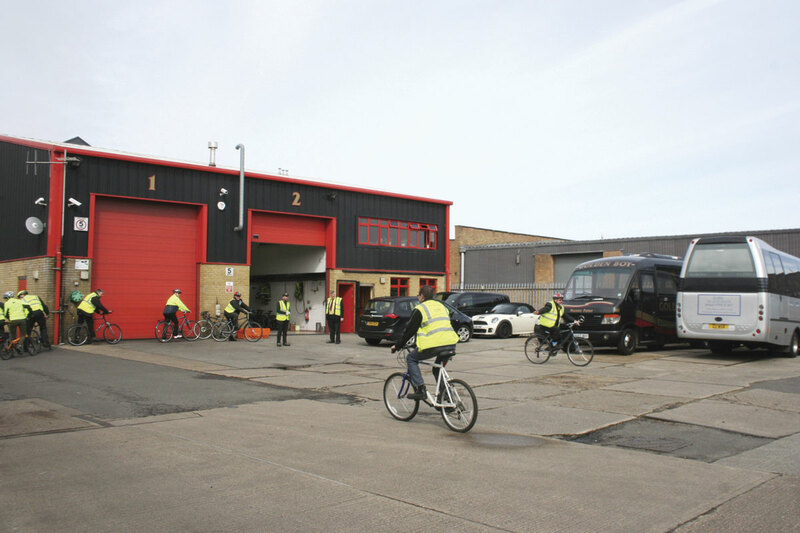 The next exercise was an emergency stop drill, with the instructors getting the riders to bike towards them and then getting them to brake quickly once a signal is given. Following this, they practiced ‘snaking’, biking in a long line. Often traffic situations require cyclists in this formation to ride side by side. This was also practiced, with signals given to change into single and double file. It is while in the yard that any trainees the instructors consider potentially unfit to cycle on the roads are asked not to participate any further. It also allows any problems that could potentially cause an accident when out in public to be ironed out. Once through this stage (and given a bit of a breather), the drivers were taken out onto the road. 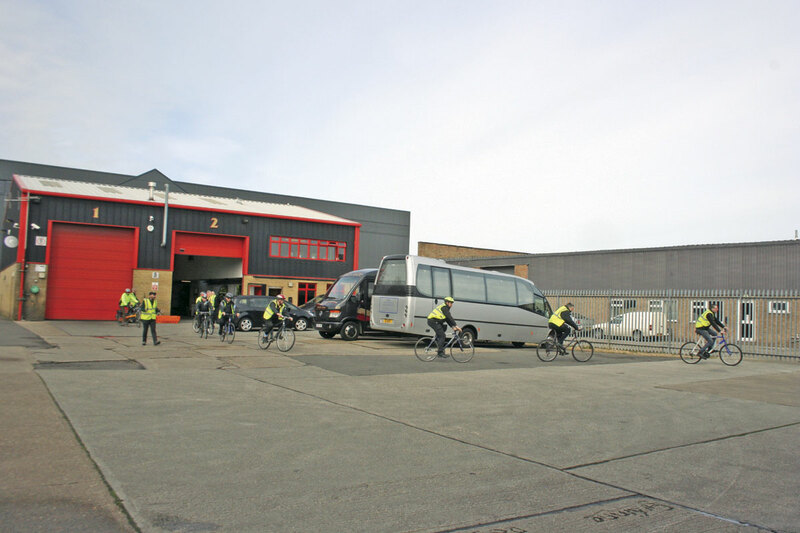 They biked to a prearranged destination, which in the case of my visit involved cycling through Golden Boy’s home town of Hoddesdon, giving the trainees plenty of practice in their cycling skills. When they reached the destination, a residential part of town, they were given more exercises involving turning at junctions and dealing with traffic. Once this was complete, they biked back to the depot and were given a well earned rest and lunch. Another positive for the training is that it is funded by FORS (Fleet Operators’ Recognition Scheme), that aims to improve fleet activity throughout the UK and beyond. The scheme is voluntary and open to any company operating a fleet including vans, lorries, minibuses and coaches. Cycle Superhighways was something explored in the classroom section of the course. After lunch, Alec Horner took over the group that had done its cycling earlier and did the classroom based training. As well as explaining the content himself, Alec also used videos, including news reels and other films to inform the trainees. For instance, to get across the Mayor of London’s vision for cycling in the capital, he used an official TfL video explaining the benefits of the Cycle Superhighways. To add an element of humour to the proceedings, Alec even showed some footage of Steve Hughes, a hirsute Australian comedian, doing a quip on cycling. It may have been a joke, but like a lot of good comedy, it sheds light on the absurdity of reality; in this case the preposterousness of health and safety, particularly around cycling. Group discussions formed part of the classroom training too, ensuring the participants are fully engaged and not just passively receiving the content. In one of them he asked the class what the benefits of cycling are. Some of the ideas they came up with were: it is cheaper than driving, it keeps you fit, it is an environmentally friendly form of transport and more. There were also discussions on what changes they have noticed on the roads in London and who they think are the most vulnerable road users. Something Alec certainly shies away from is ‘death by Powerpoint’. There was a lot more content to the classroom part of the course, but you will have to attend one to find out what else was discussed and explored. If you are interested in putting yourself or drivers through this course, then it is Minimise you Risk you need to contact (0844 335 1051). Although Cycle Confident provides the practical element of the course, it is Alec that facilitates it, having originally introduced it at Golden Boy’s centre. It has been offered for ‘well over a year now’. He has already given some people tasters of it through CPT meetings, which he says has got ‘quite a few other operators interested’.